Jonathan Loeb is a Senior Crisis Adviser at Amnesty International. He worked on the September 2016 report, Sudan: Scorched Earth, Poisoned Air: Sudanese Government Forces Ravage Jebel Marra, Darfur. 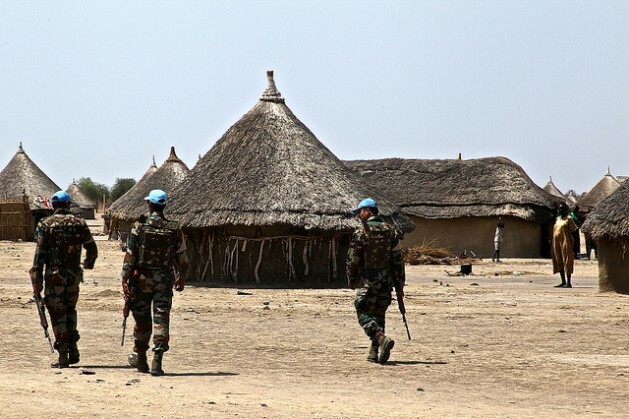 UN Peacekeepers patrolling the South Sudanese village of Yuai in 2012. Credit: Jared Ferrie/IPS. NEW YORK, Dec 20 2016 (IPS) - With the future of the United Nations peacekeeping operation in Darfur now in jeopardy, the safety and security of the Sudanese region’s most vulnerable communities hangs in the balance. Although the United Nations (UN) Security Council and the African Union (AU) Peace and Security Council unanimously renewed the mandate of the UN-African Union Hybrid Operation in Darfur (UNAMID) last June, the renewal masks deep divisions within both Councils. Some member states support strengthening the mission, while others accept the Government of Sudan’s position that the war in Darfur is over and that the mission should draw down and ultimately withdraw. Withdrawal is not a morally legitimate option. The large-scale violence against civilians in Darfur in 2016 demonstrates the urgent need for a robust peacekeeping force. A more immediate – and addressable – explanation for some of the inaction is the fact that member states are ill-informed about the severity of the abuses that are still taking place in Darfur. Despite UNAMID’s mandate to use force to protect civilians, it has consistently failed to protect the population during attacks. The mission has, however, provided protection for civilians who are displaced by violence and manage to get themselves to bases or camps secured by peacekeepers. This protection – while inadequate – is indispensable for many of the two-and-a-half million people who remain displaced at the end of 2016 and, in and of itself, justifies the mission’s continued existence. Whether there is a plausible scenario under which the UN Security Council and the AU Peace and Security Council can strengthen the mission to deliver better protection for the people of Darfur is debatable; the history of the international response to the conflict provides little evidence for optimism. The intractable nature of the conflict and the entrenched views of the most powerful members of both Councils present tremendous obstacles to action. During the past three years, hundreds of thousands of civilians in Darfur have been forcibly and unlawfully displaced by government troops using the same scorched-earth tactics that have characterised the war from its outset nearly 14 years ago. The Government of Sudan has gone to great lengths to prevent reporting on this violence. Independent journalists and foreign diplomats are forbidden to travel in Darfur unless they are part of government-chaperoned trips to government-approved locations. The lack of access has created an information black hole, leaving UNAMID as the only actor on the ground in Darfur with a mandate and responsibility to report about the conflict. This duty primarily takes the form of the quarterly reports of the UN Secretary General to the Security Council on the situation in Darfur, which include updates on, among other things, conflict dynamics, political developments, the humanitarian situation, human rights and civilian protection. Unfortunately, the mission’s reporting capabilities are severely hindered by the Government of Sudan. And it stands to reason that the government, which has been accused repeatedly of committing war crimes and crimes against humanity, will continue to resist all efforts to document its military activities. The Secretary General’s reports identify how the government hampers the mission’s reporting, including repeated denials of access to the most conflict-affected parts of Darfur and the refusal to grant visas for the mission’s staff, especially civilian staff working on issues related to human rights and protection. There are other, arguably even more crippling, tactics. These tactics – which are more difficult to prove and are not disclosed in the SG’s reports – include, most notably, the government’s continued monitoring of the mission’s activities. Civilians who speak with UNAMID about sensitive issues, and UNAMID national staff who report on sensitive issues, face a constant risk of arrest and detention. These significant obstacles notwithstanding, the SG’s reports convey a general impression that the mission is providing the Council with an accurate and reasonably comprehensive assessment of the nature of the conflict and its impact on the civilian population. This impression is false. Reports by the SG and UNAMID frequently mischaracterise the impact of violence on the population and often fail completely to report on gross violations of human rights. The large-scale violence that occurred in Jebel Marra between January and September 2016 is the most recent example of the UNAMID’s egregious failure to report. Jebel Marra is a 5,000-square kilometre volcanic massif in the centre of Darfur, consisting of approximately 1,500 villages and hamlets. The area has been a stronghold for armed opposition groups throughout the conflict; in 2016, portions of Jebel Marra were the only significant territory in Darfur still held by an armed opposition movement. Access to Jebel Marra has been largely cut-off since 2009, when the Government of Sudan responded to the International Criminal Court’s arrest warrant for Sudanese President Omar Al-Bashir by expelling nearly all the aid agencies operating in the area. No journalist, human rights investigator, humanitarian actor or peacekeeper has been granted any meaningful access to the most conflict-affected parts of Jebel Marra for years. In January 2016, UNAMID reported a massive build-up of government forces in the plains surrounding Jebel Marra. In mid-January, large-scale violence erupted on four different fronts, with government forces attacking positions held by members of the armed opposition. UNAMID had no access to the attacked areas in Jebel Marra; the SG’s reports relied on observations made by local sources and staff members on distant bases to describe the military offensive. The result was an incomplete picture of fighting between the government and members of the armed opposition. Absent from the reports was any of the overwhelming evidence that strongly suggests the commission of war crimes and possibly crimes against humanity, as well as other serious violations of international human rights law. The reports are almost entirely silent on sexual violence, unlawful killings, indiscriminate bombings, destruction of civilian infrastructure, looting of civilian property and other violations of international law, including credible allegations of chemical weapons use – all of which were carried out by Sudanese government forces during the offensive. While UNAMID’s lack of access, shortage of personnel and the real risks facing its local staff and its civilian interlocutors are valid reasons for being unable to comprehensively document the recent violence, they in no way justify the irresponsible misrepresentation of the nature and magnitude of the violence. Based solely on the content of the SG’s reports and other public UNAMID reports about the violence in Jebel Marra it would be reasonable to conclude that many if not all the tens of thousands of civilians who fled from Jebel Marra to UNAMID-protected spaces were displaced lawfully under international humanitarian law. Any good-faith effort by UNAMID to investigate, by interviewing survivors, analyzing publicly available satellite imagery, or setting up its own network of trusted intermediaries inside Jebel Marra, would reveal that this is simply not the case. Most were displaced from (now destroyed) villages, which had no formal armed opposition presence at the time of the attacks, by attackers whose purpose was to target the entire civilian population in the village. UNAMID’s unwillingness or inability to conduct either on-site or remote research into the nature of the attacks in Jebel Marra has left both the UN and AU security councils grossly ill-informed about the magnitude of the human suffering that has pervaded the region. As a result, the councils have less reason to doubt the government’s false assertions that fighting was limited to combatants. Ideally, both councils would work together to apply sufficient political pressure to overcome the government’s obstruction of UNAMID’s ability to report. In the interim, the mission’s civilian staff members need to use the considerable tools still at their disposal to document and accurately characterise the impact of violence on the civilian population and, in turn, better inform the councils about the urgent need for protection. If this is not feasible, then UNAMID needs to fully and publicly acknowledge the shortcomings of its reports to ensure that they are not relied upon as evidence of an absence of gross violations of human rights. Perversely, UNAMID’s failure to report on recent attacks in Jebel Marra largely serves as false evidence of the nonexistence of abuses, which the Government of Sudan now cites in support of its narrative that the war is over and that UNAMID is no longer necessary. The war is not over. A peace operation is still necessary. There are recent reports of a government troop build-up ahead of another military offensive in Jebel Marra expected in early 2017. This should catalyse both Councils to immediately take steps to ensure that UNAMID is prepared to protect vulnerable populations still living inside Jebel Marra. Chief among these steps is the enforcement of the status of forces military agreement between UNAMID and the government of Sudan entitling the mission to full and unrestricted movement throughout Darfur. UNAMID must be allowed to mobilise its military and civilian resources in accordance with a current threat assessment, which would inevitably involve unfettered access throughout Darfur – especially in Jebel Marra – including the ability to reposition its operating bases. In the absence of a political resolution to the conflict – which 13 years of peace-negotiations has failed to deliver – or a genuine cessation of hostilities by all parties, redoubling support for UNAMID remains the best option for delivering urgently needed civilian protection. Darfur’s long-suffering people deserve this, at the very least.